The date was September 12, one calendar day after the most devastating moment in our nation’s history. Ingenious… or foreshadowing? 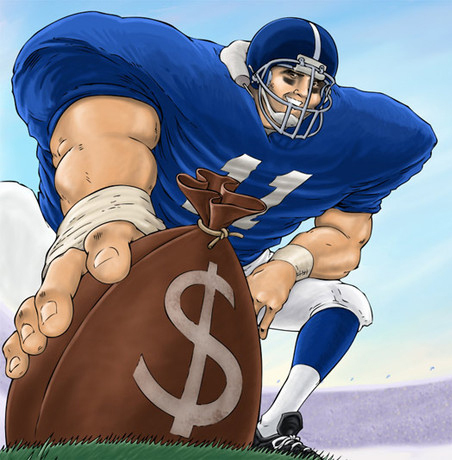 After all, big money has taken over everything else in sports. Bowl games, race cars, entire arenas and of course every NBA uniform starting in 2013. Upon overhearing Wilbon’s words, some marketing intern probably salivated, a light bulb beaming bright above his head. In a matter of time, he’ll become CEO, recalling the day he barged frantically into his boss’ office like he had just discovered the cure for cancer. I hope he gives Wilbon a percentage. But I don’t blame Wilbon, or the intern for that matter. The wheels for this were put in place long ago. The Shell Big-12. The iMac Pac. The IBM SEC. These conferences, and everything about them, brought to you by Brand X. And still the college athlete won’t receive a dime, but the big wigs will, handsomely. If major corporations can make money off a meaningless December bowl game between SMU and Eastern Carolina, imagine what sponsoring an entire conference would bring, other than the sad realization that everything has its price. Perhaps we should just embrace this change. After all, if there’s one thing private industry has shown it can do that the NCAA cannot, it is properly run a business. I guarantee if we put the nation’s top execs in a boardroom together, they’d have this whole BCS/conference realignment thing worked out in time for lunch. Who knows what the future holds when it comes to conference realignment. College football has become a fast-paced, multi-billion dollar game of musical chairs with the most, plush Barcalounger going to the highest bidder. The inequities within college football have never been more evident. When the sport realigns for the final time, with big money behind the steering wheel, let us not complain. We’ll have that playoff system we always clamored would be more favorable than its predecessor. At what cost, remains to be seen. This entry was posted in Featured, Pigskin and tagged ACC, College Football, ESPN, IBM, Michael Wilbon, NCAA, Notre Dame, Pacific Poker, Pardon The Interruption, Rush, SEC, Tony Kornheiser by Chris Humpherys. Bookmark the permalink. They’re (Notre Dame) not prepared to give up their bounty by way of the multimillion dollar deal they still maintain with NBC , Wilbon can chime on this all he wants but ’til that small point changes , this means nothing . Look at the Texas Longhorns’ tie in with ESPN …… it will net them just under $ 3 billion over the next two decades as the revenues rise incrementally with their joint venture of the Longhorns Tv Network . That deal doesn’t include the revenues that the football program currently derives from its annual schedule . And that playoff system reflects that the host venue will still have to cough up millions to the BCS for the privilege staging the BCS title game . Did Wilbon actually mention that by any chance ? Why stop at the conferences. The teams could also go down that road. Just imagine the Oregon Aflac Ducks. How about the USC Trojan condoms. The Gator Ford Dealerships of America. You’ll have to excuse me now, I have some trademarking to do. You proved my point exactly. Money talks and that’s pretty much that. We’re still quite a ways away from the finished ‘playoff’ product but rest assured there will be plenty of filet mignon dinners before it’s all said and done. I was living in Gainesville when the Swamp changed contracts from either Coke to Pepsi or Pepsi to Coke, I forget which. It was big news but not as heard about as one would think considering the tens of millions of dollars involved in that handshake. What amazes me is that deals to that extent can go down so relatively unnoticed. 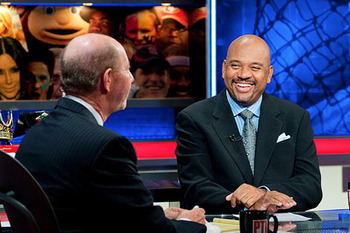 And…Since when did Tony Kornheiser start hosting PTI with Steve Harvey? You’re no link whore, Dub. You’re just a whore. It’s why we get along so well. And Wilbon wishes he could be as funny as Harvey. What we’re getting at present in terms of the format isn’t even worth being an hors d’oeuvres at a 5 star restaurant , much less a family restaurant ! Left you a succinct response concerning Schiano and the Giants’ game . Gutless , classless and if this is what the embodiment will be about concerning the Bucs. Then it indicates to me , that he (Schiano) isn’t bringing much to the table from a coaching skill-set . He’s just placed the Bucs under the microscope after the events in the game leading up to its end . In light of the idiocy that has just gone on with the Saints , Greg Schiano comes across as an anally retentive as#hole ! He is as dumb as the day is long ! And for Mark Dominik to remain silent on the matter indicates that the organization condones the actions of the players as the game ended . Karma is a b#tch and what goes around , comes around . You can be sure of that concerning the Bucs concerning payback from other teams over the course of this season . Rays blow it again , it’s over bar the shouting ! The only way they can attain a playoff berth will be , if the other contenders simply implode . Don’t know what to tell you about the Rays, Al. A piss-poor performance last night against the Sox who, at this point, are playing for nothing but pride. They’ll need to take two of the next three if they want to stay in the running. And it sounds like Schiano wants to put that final play against the Giants behind him and move on, rightfully so. The Rays are their own worst enemy and it is getting ridiculous . Maddon can make all the excuses he wants . Channel 10’s sports anchor Dave Wirth is a fool , in making comparisons between this time last season and now . If the Rays are to win out then they will need help from others beyond the fate in their own hands . Schiano can’t put this idiocy behind him because he’s now placed the Bucs in the cross hairs of every team that they will face over the remainder of the season . If he wanted to make a statement as he suggests then it would have helped if the defense hadn’t allowed over 600 yards to be ratcheted up against them . In other words Schiano hasn’t a ##cking clue as to what it takes to coach a team ! . He should remember Rutgers is a different environment from the NFL . The Bucs defense is ,like a porous feminine hygiene product and who would say any different ? Goodell insists he will not abandon the use of replacement referees and replace with them with the female servers from Hooters . Son of a b@@ch , why not ? LOL,LOL,LOL !!! It would definitely be an improvement don’t you think ? Six games down with sixteen to go. The only comparisons made from this year to last in regards to the Rays must be made with the hopes that they can actually match what they did last year which is seeming less and less likely with every loss. It doesn’t get any easier for the Bucs this weekend either. While the Cowboys don’t look like world-beaters, they spanked us pretty good at home last year. I don’t have a good feeling about this upcoming game either. Replacement officials are affecting the quality of the game this year. Looking forward to that piece. God knows the sport could use some common sense right about now.